Between buyers and home sellers in Nashville, we’ve been really lucky over the past few years to work with families with some really cute kids, and some really cute kids’ rooms. Kids’ rooms sometimes get short shrift when we’re talking about home staging and home design, since not every buyer has little ones. But a cute kids’ room can really make a home shine — and these days, as much thought is put into a well-designed kid space as any other key room in the house. For the new Nashville homeowners and Nashville home sellers looking to make their kids’ compound as cute as can be, here are a few of the home-decor options we swear by, some local, some less so. If you’re into wood toys/blocks, Arcade in Hillsboro-West End is a treasure trove. Their room-decor selection is sweet too, from super-cute pillows (1) to fun wall decor (2). 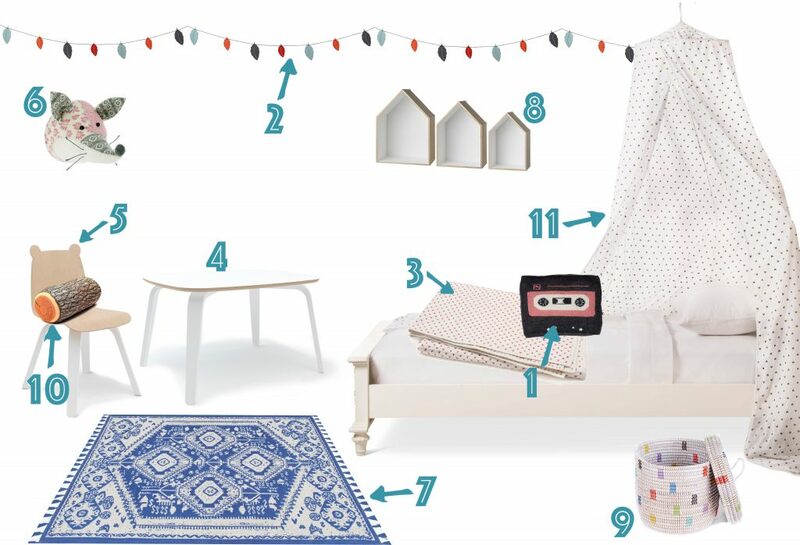 Scout is a locally based online shop, so they have a solid selection of easily clickable kids’ stuff, including really cute toys and some great bed linens (3) if you and your little one appreciate classic patterns. Cool kids’ furniture is fairly tough to find, but that’s something Magpies (whose brick-and-mortar location is on the outskirts of Belle Meade) excels at stocking. This modern Oeuf play table (4) and bear-ears chairs (5) are a good example. Another Magpies favorite: their selection of handmade wall-decor animal heads (6), from bright green dinosaurs to patchwork bears, all ridiculously cute. This East Nashville shop isn’t geared toward kids, but they always seem to stock the best selection of colorful rugs (7) — including vintage ones — that’d make a kids’ space extra stylish. Local kids’ shop Rich Hippies, located in Germantown, is stocked with the coolest of cool clothes, toys and decor. They also have some really great storage options — including the Bloomingville Wood Display House (8) and Swahili Storage Basket (9) — and don’t slouch on the pillow selection, either (10). We try to shop local as a rule. But have you seen the Pillowfort stuff Target’s been selling lately? It’s some of the most stylish kids’ decor you’ll come across, from simple things like curtains and sheets to dreamy bed canopies (11) and furniture. Have other favorite stops for kids’ decor in Nashville? We’d love to hear about your go-to shops. If you’re still looking/about to start looking for a new Nashville home for you and your family, we’d love to help you find it. Call or email ACRE here, or start your Nashville househunting process by filing in this quick form.